It will conduct the screening process to all the applied candidates. Earlier, the Commission has issued the notification of Central Police Organization (CPO) for SI in Delhi Police, SI in CAPF’s, SI in CISF and invited the applications. A large number of candidates applied for the examination. The written exam was supposed to be held on 20th March, but it was postponed to July due to the paper leakage. The Commission had canceled the CPO written examination (paper-1) 2016 for SSC SI ASI Delhi Police that was held on 20 March 2016. Apparently, the question paper in the afternoon session in some centers had leaked before the exam began. The re-exam in Computer Based Mode was organized on 4th, 5th, 6 and 7th June 2016. Only candidates who participated in the afternoon session of the 20th March exam took the re-examination. A large number of candidates appeared in the examination. All the candidates successfully give the exam on the particular date or timings as provided by the commission. Those candidates are eagerly waiting for the result. The Staff Selection Commission will release the Central Police Organization (SI/ASI) Re-Exam Paper-1 Results on 20th July i.e. today by 6 PM on the official website. Now as the results will be out today, the aspirants can check them from the official website. The first step is to open the official website of www.ssc.nic.in. 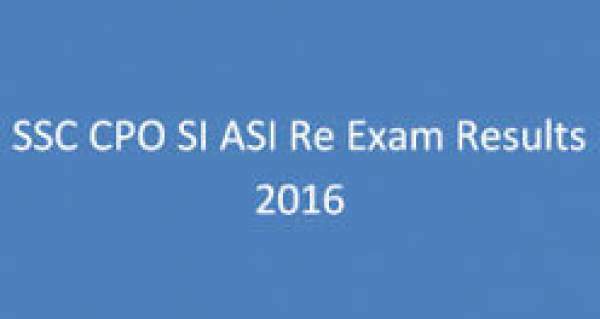 Then click on the link ‘SSC CPO (SI/ASI) Re-Exam Result 2016‘. Then enter the details of the applicants such as registration number, date of birth and other information in the provided field. Then the result will be displayed on the screen. Check the result and save it. And download the result. Then take the printout of the result for future reference.